The Swing Trading screen is our third most popular screen at the time of writing and is also the first screen in this series that was submitted by a chartmill user. A great share by this user! Not only do we like it, but also other chartmill users are expressing their appreciation by voting the screen up in the list. Price: Above 20, ETF: none, Average Volume: 50 SMA > 20K: These are just some general filters to avoid low priced stocks without enough liquidity. Also ETF’s are avoided. Signal: Strong Stocks: This is one of chartmill’s special filters to select only the strongest or best performing stocks in the market. Signal2: Near 20 day High: This filters for stocks that have their current price near a 20 day high. The filter limits the maximum distance to the 20 day high to 5%. 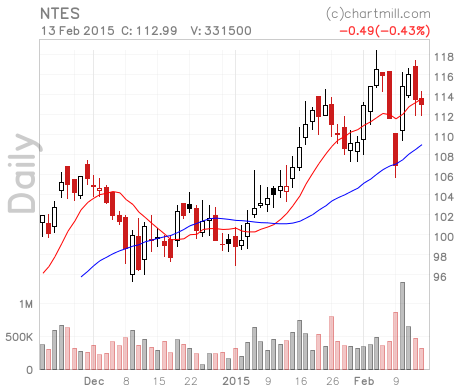 SMA1: Price Below SMA 10: The stock should be below its 10 day moving average! So in the short term timeframe prices have been pulling back. 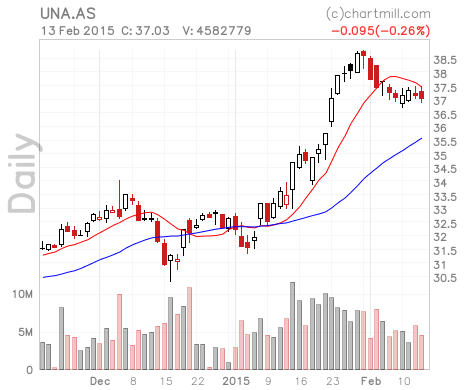 SMA2: Price Above SMA 20: The stock should be above its 20 day moving average! So in the last couple of weeks, the stock has been going up. The combination of these filters give you a list of recent pullbacks in the strongest stocks in the market that are still near their 20 day high. A slight variation would be to remove the ‘near 20 day high’ constraint and only filter on below 10 day moving average, but above 20 day MA. This gives a couple of additional results that still look fine. NTES is one of the results when running the screen today. In the beginning of February, we see a new high was made, followed by a rather strong sell off, which was again followed by a rather strong return to the highs. And in the recent today there was again a pull back, but this time on lower volume. UNA.AS is another result of the screen, showing a rather clean pull back after a strong run up.